For the first time, India is recognizing Non-Resident Indians as one of the reasons "India has been shining". 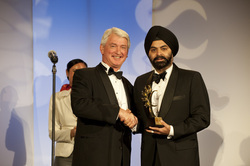 Remit2India, which is the first on-line money transfer portal for NRIs is celebrating their ten year anniversary by organizing the first ever The Light of India Awards ceremony at New York City’s Waldorf Astoria Hotel on April 22, 2011, which is invitation-only. The ceremony's goal is to recognize exemplary achievement by the non-resident Indians in the fields of business leadership, corporate leadership, political leadership, science/technology, journalism/literature, and arts/entertainment. 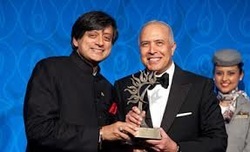 Nominees for the Light of India Award include individuals from America, Canada and England, including individuals such as: Ajay Banga (CEO of MasterCard), Salman Rushdie (Writer), Russell Peters (Comedian), Bobby Jindal (Governer). There are two different types of awards that will be presented during the ceremony which includes the "Jury Award" and "The People's Choice Award". The "Jury Award" is selected by a Jury panel that consists of prominent figures in India such as: Javed Akhtar (Screenwriter), Shabana Azmi (Actress), Shiv Khera (Author) and many more. "The People's Choice Award" will be picked based on votes from the public on-line from any part of the world. On-line voting will end on April 15, 2011. 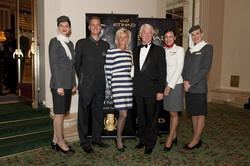 Anyone can vote and once an individual has voted they will be entered to win two-roundtrip tickets to India courtesy of Etihad Airlines. NEW YORK: Glitz and glamour filled the halls of the Waldorf Astoria on April 22th , 2011 for the first ever “Light of India Awards” presented by Remit2India. This annual event was established to to recognize exemplary achievement by Non-resident Indians in the fields of business leadership, corporate leadership, political leadership, science and technology, journalism and literature, and arts and entertainment. 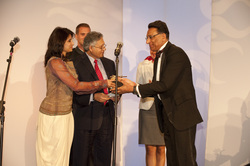 Over two hundred of the South Asian’s elite were in attendance for this grand awards ceremony. 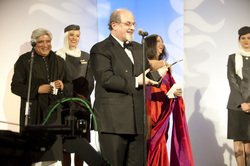 Celebrities in attendance included Shabana Azmi, Javed Akhtar, Salman Rushdie and Aasif Mandvi. The awards ceremony was filmed to be broadcasted on Sony Entertainment Television in more than 150 countries around the world.